I mentioned before my kids are reading through the How To Train Your Dragon book series. They are loving the stories and the very colourful characters and all their strange activities. I must be honest I love the way these stories have been written – the descriptive language used is brilliant and inspiring for creative kids. We have used the stories to investigate a bit of Viking history but the kids have also been loving the imaginative side of the stories – the dragons and amazing creatures in the books. And yes both of mine have started creating their own very creative dragons. I often get informed of some strange new name and then told all the amazing facts about this creature. 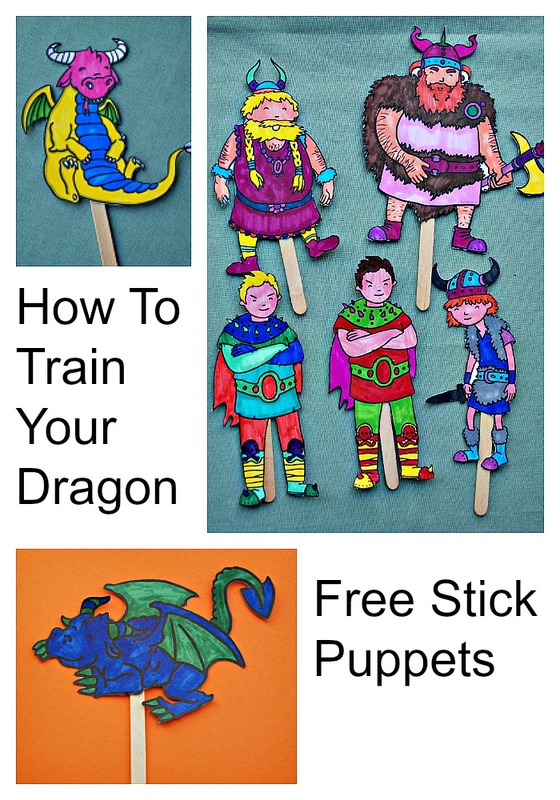 So last week when my son asked if there were any dragon stick puppets he could use I had a quick search and was thrilled to find some FREE to download How To Train Your Dragon Stick Puppets from Twinkl Resources. We printed the black and white version so the kids could add their own flair to the characters. I really am a big fan of printing these in black and white and not the colour version because every time one of the kids coloured in they changed something and that change also resulted in them changing some of its characteristics. With their “fireflyers” above the one with the blue wings breathed out an extra hot blue flame that could not get extinguished with water. And their version of Toothless is super cute. They also have a few of the key Viking characters in the set as well. I love this series of books as I think they encourage the kids to get creative with their own stories and create their own magical characters with descriptive names and wonderfully unusual traits. I also think stick puppets can be a great tool that allows the kids to act out their stories and so doing so helps them with their creative process of how the characters look and what activities they do. This entry was posted in Homeschooling and tagged free printables, home ed, home education, homeschooling, How To Train Your Dragon, Twinkl. Bookmark the permalink.